Well, I'm not giving anything away...yet, maybe I will another day! But, I came across a blog doing a giveaway of something I'd really like to win! :) I wanted to share it with you, hoping that if I don't win...one of my friends might be a lucky winner! Check it out at http://www.thenotsoblog.com/2009/07/spunky-monkeys-review-and-giveaway/ . She's giving away a really cute swim suit cover-up!! I just wanted to share a couple of really good recipes I've come across recently--blueberry muffins & banana bread. I'm sure you can find dozens and dozens of recipes for these two...but, I think these recipes are pretty fantastic! I hope you'll try them. Combine 1 1/2 cups flour, brown sugar & white sugar, salt and baking powder. Place vegetable oil into a 1 cup measuring cup; add the egg and enough milk to fill the cup. Mix this with flour mixture. Fold in blueberries. Fill muffin cups right to the top. Bake for 25 minutes in the preheated oven, or until done. Bake at 350 degrees for 60 minutes, or until a toothpick inserted into the center of the loaf comes out clean. Cool loaf in the pan for 15 minutes before removing to a wire rack to cool completely. This is very, very good. I sometimes sprinkle in just a tiny bit of cinnamon & nutmeg, too. This morning I attended training at the Watermelon Patch. I think I'll really enjoy working there--they have so many fun activities, events, and parties--from laser tag to "girls just want to have fun" to art & cooking, and many more! In fact, I have several business cards which I have been instructed to give out that entitle you to ONE FREE CLASS! Check out their website to see all the classes that are available. Leave me a comment and I'll be glad to get a card to you. After the training Mom, Mimi, Taylor, Ella, and I went to eat lunch at one of our favorite places--San Miguel. We all love Mexican food--especially Mimi & Taylor. Two people who don't eat much but can really put away some chips, salsa, & tacos!! :) Taylor also loves the music there and was shaking her groove thang in our booth!! Oh, my sweet, quiet, & shy Taylor--what happened?!?! Well, she's still pretty sweet, but she has quite the energetic & funny personality now. Tonight I headed back to they gym after missing what seems like an entire month from working out. It was good to get back on the elliptical machine, but here it is nearing 11:30 and I'm still WIDE AWAKE! That's what happens when I don't get home from the gym until 9. Ella had 2 firsts today! I pulled out the doorway jumper that Taylor loved as a baby. Guess what..Ella loves it, too! She's always kicking her legs and seems really strong. She just grinned and smiled at Tay and I when I put her in the jumper. I'm glad to have something I can put her in for a few minutes to keep her happy! After the jumper, I gave her a few bites of rice cereal. I think she loved it! She was starting to fuss since the jumper wore her out & she fell asleep shortly after that so she didn't eat much. But, we'll try again tomorrow. I'll take some pics and post them. Well, I guess I'll go lay down & hope that I fall asleep soon. I hope everyone else had a great Monday! We had a great weekend with some fabulous weather (finally!). We blew up Tay's swimming pool that Gran gave her for her birthday. She had a blast playing in it. I must admit that I splashed around in it a bit, too! Saturday morning it was so nice before it got too hot. Saturday afternoon I had a training for my new job. I'll be working a few hours a week at the Watermelon Patch! We've made a plan to go to Disney World in November 2010...it seems a long ways a way, but I know it will be here before you know it! Tay can hardly wait--she can name all the characters on Disney Playhouse. So, my bit of extra income from the Watermelon Patch will be just fun money and also go towards saving for our big vacation! Tay actually starts Summer Camp at the Watermelon Patch next Tuesday and I know she'll love it. We had a great morning at church. Bro. Fred preached on "Priorities"--God first, family second, work & other relationships are third. These are based upon God's law as stated in the 10 Commandments--1. have no other gods before me 2. honor thy father & mother, do not commit adultery 3. do not covet, do not steal (honesty & integrity are what God calls us to). It was a great message and something I will consider regarding all areas of my life and how things are prioritized. I will include a few pics from the weekend. The first is a picture of Taylor with a really cute purse & matching hairbow from Gran. (By the way, Gran is selling these if you know of any girly girls that would like one! She has the purses & bows in different colors (the bows have 3 different color ribbons--Tay's is blue, pink, & yellow--it's hard to tell in the pic) and I can send more pics if interested. They are $8 for the pair.) The second is from lunch today at Mawmaw & Pawpaw's house. The third one is actually Ella sleeping when she about 3 weeks old. The final one is from yesterday as I watched Tay swim--see how much she's grown!! Oh...one more thing, if you happen to read this before tomorrow (Monday, June 1st) at noon...head on over to Dori's blog to register for a giveaway of Jennifer Rothschild's book Self Talk, Soul Talk. Just leave her a comment & let her know that I referred you there. I found Dori's site through her comment to a post at Beth Moore's blog. Dori seems to have a great blog titled "Your Word is Life to Me". Check it out! :) Maybe, you'll be a winner of the book! We plan on having Ella and Taylor's pictures taken this week. Looking back at Tay's 3 months pictures, Ella and Tay really do look quite a good bit alike at this age. It's hard to remember Tay's personality at this age. But, Ella is a very smiley baby and loves to snuggle. She makes all sorts of sweet and funny coos and noises. We had a good Memorial Day weekend, but didn't get to do all the fun things we had planned because it rained off and on all weekend long. But, we grilled Saturday and today and had great food. I love the smell of the grill. Tay is getting good riding her new bike that she got for her birthday. She has a bit of difficulty with watching where she is going though because she is looking and concentrating on her feet so much! Unfortunately, we didn't get to blow up her new pool because of all of the rain. Tay has also learned how to push her step stool over to turn the light off & on in the bathroom. Yay! This is a big time accomplishment. It gives her a lot of independance which she loves. She really likes to do things by herself!! Tay LOVES going to Sunday School. It makes me so glad. She's come so far from screaming and crying when we drop her off to running down the hall when she sees her teacher waiting to greet her! Oh, I love it! She talks about Sunday School all week and is very quick to correct me when I slip up and mention church. She says, "No, Mommy! YOU go to church; I go to Sunday School!!" Ella still hasn't rolled over yet. I say it's because she never lays on the floor longer than a few minutes. This gal likes to be held...all.the.time.!! The batteries on her swing died (again!) this weekend. I thought "Oh, No!!" That's the only way I get a break from holding her during the day!! We're definitely hoping for better weather this week so we can spend some time outside. Whew, we've been cooped up in the house for too long! I hope everyone has a great week! So, I took the week off last week from blogging. Sorry! Once I got so far behind in the week, I just figured I would start over today. Here's what we'll be having for the next 2 weeks. Again, if you see something you would like the recipe for, just leave me a message. And, you'll see some repeats from my previous menu because we didn't get around to cooking every night because of things that came up at the last minute. The beef, tomato, & cheddar mac was a HUGE hit with Tay--she had THREE helpings the first night and asked for it for lunch the next day! So, I'll go ahead and post that recipe at the end of this post. It's so easy to change it up to with different type chopped tomatoes & shredded cheeses. I may do it mexican style next time with rotel and monterrey jack. Yum! Brown the ground beef with the onions, drain. Stir in the tomatoes, water, and macaroni. Cover and simmer 10 minutes or until tender; stir in cheese and serve. I know I've been going on and on about how great Beth Moore's latest Bible study on Esther is. I've also been following her blog recently and it's great, too! For the past two weeks, her youngest daughter, Melissa, has been blogging while on a trip with Compassion to Calcutta, India. It has been absolutely amazing & eye-opening to read about her experience there. No lie...I've cried every single day I've read an entry she's written from India! It's just incredible to read about how the rest of the world lives while I feel bad for myself that I can't afford something as small as a pedicure or as big as a vacation or a new car. For goodness sakes, these people are starving, without power, without homes, and without knowing that someone loves them. It breaks my heart. So, I encourage you to check out the Living Proof blog. You'll have to go back just a little ways to start reading about Melissa's trip. You'll also find posts from Beth and her daughter Amanda. They are sometimes thought-provoking posts, but often they are just laugh out loud funny! I just love this family--they are so REAL! Anyhow, back to Melissa's trip with Compassion. Just this week, I was reading about Melissa's final day in India and crying my eyes out! Taylor asked me why I was crying and I showed her the picture of the beautiful children Melissa met. I explained to her their situation and that these children needed help. Well, truth be told, I often feel bad for those left fortunate, but never act on it...never really do anything to help. But, this hit me. That same day, as I was in another room I hear Taylor singing. As I near her, she is singing "Jesus loves the little children, all the little children of the world, Red & Yellow, Black & White, they are precious in His sight, Yes Jesus loves the little children of the world." Of course, I had to decipher a few of the words...but, you bet I got the message! Wow! We sing "Jesus love me" all the time, but I haven't sang this one to her in quite awhile. I was amazed at how God speaks through my own child...right then, I took Tay to the computer and we picked out a child from Compassion's website. We are now sponsoring a beautiful little 5 year old girl, Maher, from India. I anxiously check the mail each day waiting on my packet from Compassion with more information about her. I can't wait to mail her a letter. What a privilege! Seriously, I am tearing up now as I type just thinking of them. Here's an excerpt from her last entry. If you don't feel compelled to sponsor a child, simply pray for them. After playing with our children for about an hour or so, I realized that our leaders were signaling some message to us. Our time was coming to an end. We had been so busy anticipating meeting our sponsor children that for some reason we hadn't even thought about the reality of having to say good-bye to them. As we hugged them good-bye for the last time my heart began to race and I noticed that Manot urgently kept saying something, the same line, over and over again to me. So, I beckoned the translator and I said, "Can you translate what he is trying to tell me?" I assured him through my tears that I would never ever stop praying for them. That was the last verbal exchange we had before we said good-bye with oversized lumps in our throats and then we waved and waved and waved. I can’t count the times they looked back at me. They hung out of the window of the van, and we blew about a million kisses back and forth. As the van started to move, I felt my heart sink. Sunday was our last week of studying Esther. Like I said last week, I've enjoyed it SO much! It's been quite awhile since a study has impacted me as much as this one has. The lessons were so practical and applicable. A few key points from it, I'm sure I'll remember always. I spoke with one of the co-facilitators of our study about getting a group of young women together this summer to do the study. So, I've already put a call in to the church office to get the DVD lessons from them. I'm so excited to get started again...I'm having withdrawals! I've spoken with a few friends who are interested in doing the study already. My hope is to start in June. So, if you are interested in doing the study with us, just leave me a comment! If you've never done one of Beth's studies, she can be in depth and there is a commitment to doing daily homework lessons--but, it is SO worth it! Be praying for a location for us to meet for Bible study. I have a few places to check out before we decide. Also, be praying about getting the word out for the study. The message of the Esther study is so great & I think that so many young women could really benefit from it. If you'd like to see what it is about, you can check it out at http://www.lifeway.com . Well, I've only made it to the gym once so far this week. :( When I don't make it to workout, I automatically start feeling frumpy. It's amazing how exercise just makes you feel better about yourself whether you are losing weight or not. So, I hope to be able to go to the gym Fri. night & Sat. afternoon to make up for my lack of exercise this week. Strangely, I weighed at the gym on Monday & was down 5 lbs., but weighed today at Mom's house...and I was up 2 lbs.! So, who knows! I wouldn't doubt that I was up 2 lbs. after celebrating Tay's birthday for about a week! We had pizza, cake, & then a big lunch after Ella's dedication. I've been eating more than usual with all the celebrating! Ella loves sitting up like a big girl in her Bumbo seat!! Whew, we had a busy couple of days! Last Friday, we took a trip over to the Dauphin Island Estuarium. We're so fortunate to live so close to beautiful sandy beaches, though we rarely go. I had connections through one of the great nurses I work with to get us a special tour! We went with a few friends from our playgroup and had a great time! The kids loved it. We saw fish, baby alligators, turtles, snakes, octopus, crab, frogs, and lizards. It was a great learning experience, too. The kids got to "pet" the snake, turtles, and crab. We also got to see many of the animals being fed, too. It was a great trip. Tay loved being outside there, too. The weather was beautiful and she definitely wants to go back to the beach sometime. For a day trip, Dauphin Island is a great place to go. Saturday was Tay's birthday party at the Watermelon Patch. Oh, we had so much FUN! It made me so happy to see her so happy! Nana, Poppy, Mimi, and Gran were there. Aunt Ashley, Seth, and Cruz attended. Aunt Shelli came and brought Emma Kate and Hadley. From our playgroup, Miss Hannah came with Parker and Miss Julie brought Cole. The kids wore themselves out! :) I promise I'll get my pictures developed soon & will be able to post pictures. Sunday we had baby dedication at Luke 4:18 Fellowship. It was a very special morning. We were so honored to have Mawmaw, Aunt Cheryl, and Uncle Harold drive over to celebrate with us. The poor nursery workers probably had their hands full with Tay, Cruz, and Emma Kate all in there together! :) Mom & Dad, Ash & Seth, and Shelli & Mrs. Robinson attended church with us. There were 3 other babies dedicated in the service. 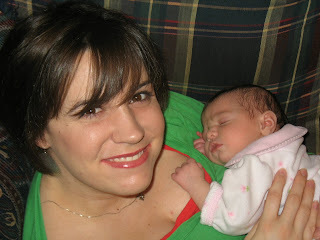 Though Ella was the youngest, she certainly wasn't the smallest--love my chunky monkey! Ella did great and didn't fuss or cry at all during church. Afterwards, we had a delicious lunch at Mom's house. What a great day spent with family! I'm so thankful for them. We were exhausted yesterday after a weekend full of activities! So, we've taken it easy so far this week. Tomorrow, we'll be going to the Exploreum and have a playdate planned with a few friends on Friday. I'm really enjoying the time I have to spend at home with my girls and doing all sorts of fun activities together! I can't wait to post tomorrow's "Toddler Tuesday". We had such a fun (but busy) weekend with Tay's 3rd birthday party & Ella's baby dedication at church. I'll try to post some pictures this week, too. I am AMAZED at how fast Ella is growing! Another busy week has gone by! Seriously, is Ella almost 3 months old & my first "baby" Tay is 3. I've actually been a bit sad over it the past few days. Wow; they're growing up so, so fast. Not that I want any more kids, for sure, but it makes me sad that I can't do it all over again. Oh, how I love my girls. They're my heart. Not much to post regarding this week's menus! It's been over a week since I've been to the store. But...here's what we'll be eating this week. Just leave me a comment if you want a recipe! I'm really not doing much cooking, actually! Friday--if Scott doesn't work in the yard, we'll grill thick cut pork chops marinated in Dale's (so yummy). If he does work in the yard...I'll have to think of something to cook inside! The girls and I stayed busy over the weekend while Scott was in 'Tega. On Saturday, we tried out a ballet for tots class. To tell you the truth, it was very disappointing. I'm not sure we'll go back. We actually walked out in the middle of it. Then, we went to a birthday party for a sweet little boy from the class Taylor was in at daycare. The only unfortunate thing was that it was at a park...which typically is a fantastic thing! But, I had Ella with me & it was very hot. So, I couldn't juggle holding Ella in the heat & watching Tay play on the equipment. I feel so badly sometimes when I can't do what I used to with Tay because I have to hold and take care of Ella. For the most part, Tay does so well and is so patient with me and Ella. Well, the weight loss has really stalled the past few weeks. Truthfully, I'm rather glad it's stall and not gone up! After all the celebrating, pizza and cake, etc....I'm surprised! Plus, I haven't been able to work out as often since we've had so much going on. I only have 3 more months until I return to work (wow!) and still hope to lose at least 15 lbs. by then so I really need to get moving. As for my Bible study, this is our last week of Beth Moore's Esther study. It is bittersweet. I have really, really loved it and am so sad for it to be over. What a journey. We started this study just 6 days after Ella was born. Two key points I will always remember from this study and wish for everyone to know for themselves: My God loves me. My God is GOOD. Just these 2 phrases have really changed my perspective. I'm so thankful. I hope to be able to share and do this study with a group again. To share a "favorite" this week, I want to point you to Beth Moore's blog at http://livingproofministries.blogspot.com. This week, Beth's daughter Melissa, is in Calcutta with Compassion International and has been writing about some amazing things she's seen there. It has brought me to tears! Ok...well, what an assortment of things have been covered in this one post! The girls keep me so busy & I'm usually holding Ella. So, I thought I better get all my blogging in when I have the chance! Where did the week go?!?! Wow, I can't believe tomorrow is Friday...ALREADY! The first two days of this week were spent holding Ella for nearly 48 hours straight! I don't mind doing that typically, but I got absolutely nothing done for 2 whole days and felt like a complete couch potato. Mom & Dad were so great to watch the girls for us Saturday when we went to A-Day, but they said they had to hold Ella all day or else she fussed. This is not typical around here! She's normally totally content napping in her swing which gives me some free time. But...sure enough...I had to hold her A LOT the first few days of this week. (This also made blogging difficult (actually impossible!). When I went to the gym Wednesday night, it had been nearly a week since I had worked out. I was feeling totally frumpy & didn't want to weigh in but I remembered my commitment to do so on the blog. Thankfully, I hadn't gained any. Whew! I'm still feeling rather frumpy though since I haven't been able to work out as frequently this week. We used our new Kirby vaccuum cleaner to shampoo the carpets tonight! It turned out really well considering how terrible our carpets looked!! After getting the abdormal results from Ella's newborn screen done in the hospital, we received a letter about 2 months ago saying they had collected "insufficient amount of blood was collected" for her repeat newborn screen done in the doctors office. I thought...you have to be kidding! After the situation with the cystic fibrosis testing, I surely thought we were done with the newborn screen. Well, here we are & Ella will be 3 months old next week. Yesterday, we got another letter in the mail saying we needed to bring her in for the newborn screen for...you guessed it..."insufficient amount of blood was collected"! Oh, man! So, I guess I'll need to take her back for that again. Scott is leaving for Talladega at 6 in the morning. I don't like staying home alone, so the girls and I have a weekend slam-packed with activities! Mom and I are responsible for bringing refreshments to our Esther Bible study. We really went back and forth trying to decide on what to prepare. Mom is going to make a spinach salad with mandarin oranges, almonds, feta cheese, and poppy seed dressing and a fruit trifle. I'm sure both will be delish! I'm making a pasta salad and chocolate chip pie. We only have 2 more lessons of our study. I have enjoyed it so, so much. Along with the Ester study, I've been listening to Beth Moore's online study from the website I posted awhile back--http://www.oneplace.com. There are just so many things God is teaching me through both studies. This week, as I was listening online, Beth was teaching about holiness--that we are to be holy. God calls us to be holy. You might ask...how am I supposed to be holy!? The only holiness within us comes from the Holy Spirit, nothing of ourselves. So, you must be filled with His Spirit. Another thing that hit me, I actually laughed out loud when I heard this, was that we are called to "other than this world"--set apart. She said we are called to be the "Others"! Now, if you're a fan of the show Lost, you might get a kick out of that like I did! I've really been praying about and thinking about what that means to be an "other". I've also been thinking about how I can best minister to others. I want everything I do, everything I say, and every way I behave to point to my Lord Jesus. Sorry this post was so random, there was just so much I missed out on writing about this week! I'm so grateful that after such a rough week last week, things are back to normal around here. I was scared that Tay was trying to give up naps when she was so fussy last week...but on Monday & Tuesday she napped for 2 1/2 hours & today she napped for over 3! I can't tell you how important that quiet time means to me. It's important to her, too. She has had such a different attitude & perky personality this week! At dinner one night, "Mmm...this is TASTY!" "Jesus is in my heart...but, not in Allie's heart!" "When the bad men hit Jesus (while reading the Easter story), they went to TIME OUT!" Ella is still being her sweet, smiley self! I got some really cute pictures of Tay "holding" Ella yesterday. I'm just amazed at how much Tay loves her; it's so precious. Today, we went to Megan's house for Charlie's 2nd birthday playdate. We had a great time. Taylor kept saying all afternoon that she had fun at "Megan's house!" The weather was awesome & the kids played in the backyard. The party was a "Cars" movie theme and Megan had made cupcakes. Tay was able to take home a little "Tow mater" toy! On Friday, we have a playdate planned at the Environmental Center. I haven't been there since I was in elementary school, so I'm looking forward to going. I'll take pictures and post them here soon. We'll be having a picnic lunch there, too! Tay starts her "Ballet for Tot's" class this Saturday! Unfortunately, Scott & I will be going to Tuscaloosa Saturday for the A-Day game...so, Poppy will be taking her to her first class! :) Won't that be cute! Tay's little buddy, Elizabeth, is taking the class, too. So, I hope she does fine without me for the first week. Oh, I just realized that I hadn't posted Ella's 2 month stats: 12 lb. 6 oz. & 23 inches long!! Woo-hoo! She's in the 90% for weight & 75% for height. Too cute! Well...I've committed to weighing in & posting my results here...but, I'm a little disappointed now that even after 2 weeks of working out at the gym...I can't seem to get the scales to budge! I still need to drink more water and will try to commit to that this week. Is there anyone else that is trying to lose weight--what are your goals? how are you trying to lose it? Let's encourage each other! Walgreens reportedly has all of their Easter candy 50% off. Hershey's Kisses are usually priced at $2.50 a bag. So if your store has the Easter Hershey's Kisses 50% off, that makes them $1.25/bag. Buy 4 bags for a total of $5 plus tax and then submit your receipt for the April EasySaver $5 Hershey's rebate (#25) to get these for free after rebate. Target coupons are great because you can print and use as many as you want! They can be found here. These deals are courtesy of Money-Saving Mom, a great site with many more deals than I have listed. It's a great resource for saving money and is a big help to me. I'm not quite following my schedule of daily blogging, but I wanted to let you know of one of my favorite websites that I've come across recently. It's one place media --home of free Christian radio. I love it! There are so many speakers/teachers and on so many different topics. I love listening to it while I'm cooking dinner, especially my favorite is Beth Moore! I hope you'll check it out. Whew! So, last week was ROUGH! But, thank goodness my sweet Taylor is back to her normal self! Therefore, I didn't get much blogging done last week since I was usually holding either her or Ella...or both of them! Saturday--Scott & I will be in Tuscaloosa for the A-Day game! Sunday--barbecue chicken/baked beans/pasta salad...we're having friends over to watch the A-Day game on TV...yes, Scott's that excited about Bama football! Well, I spent most of the day holding Taylor & Ella. Tay's 2 year molars are coming in and it's been very painful for her. So, I didn't get a chance to post about my experience at the Living Proof Conference with Beth Moore. It's nearly 11pm, so I'll hopefully be able to set aside some time tomorrow to do that. Well, the scales didn't appear to budge this week! I only made it to the gym once last week because we had something going on every other night. But, so far this week I've done better--Mon. 30 min. on the treadmill at home & 30 min. on the elliptical machine Tues. & Wed. at the gym. My friend, Megan, wants me to join her for an early morning cycling class...but, I'm scared! :) Hopefully, I'll work up the nerve to do it soon. Toddler Tuesday...more like Tantrum Tuesday! Thus far, we've had a difficult week! Taylor stayed up late for a couple of night's over the weekend and missed a nap or two which always makes the days a little more complicated! Today, she complained of her tooth hurting. I was scared at first that she may have a cavity, but I actually think she's getting a new molar in. Poor thing...she's been crying about it all day. I scheduled her for an appointment at the dentist in the morning. This will be her first cleaning, so I hope it goes ok.
Ella will be going in for her 2 month check-up tomorrow afternoon and will get a few shots. Between the teeth cleaning for Tay & Ella getting shots...we could use some extra prayer for tomorrow! I can't wait to find out how much Ella has grown. It's amazing how fast she's growing. We got a note that she needed to have her newborn screen done...again! So, they'll draw blood for that, too. After the results from the hospital came back abnormal for CF, I'm praying this will come back just fine. Ella smiles quite often now & we just love it. She's all gums! I'm so pleased with how well Tay is doing in Sunday school. I bought her some shiny white shoes for church and she wears them all the time. They have a tiny bit of a square heel and she likes the way they click on the floor and says "Look mom, I'm a LADY!" She's so funny. The Sunday school teachers tell me how sweet she is which just makes me beam. They wear her slap out though! She comes home and goes straight to bed and sleeps for hours without even eating lunch first! Tay had her first haircut today! I'll post pictures when I get them developed. She did very well and sat really still! The girl cut off about an inch and it's really going to help to make it look thicker and emphasize her cute curls in the back! This morning I took the girls to the library for a Pokey Little Puppy special storytime. The librarians made puppy headbands for the kids to wear and read 3 or 4 books about puppies. They showed a carton about the Pokey Little Puppy and then the guest of honor arrived. Tay was pretty uninterested until the dressed up "puppy" walked in and the she was excited! She got her picture made with him and was pretty upset when he "had to go home"! They gave us puppy coloring sheets and cookies and juice. Friday we're having an Easter egg hunt with our playgroup. She had such a good time hunting for eggs last year. I'm bringing rice krispy treats made with pink marshmallows and will use Easter cookie cutters to cut them out in shapes. I'll be sure to take plenty of pictures! Leesburg is having an Easter egg hunt Saturday afternoon, so we'll probably go to that one, too. Hmm...what to make for dinner this week? I have a freezer, fridge, and pantry full of food...I just need to figure out what to do with it. :) This is one reason I'm a big time fan of menu planning before grocery shopping. I always go to the store with a list & a plan! Otherwise, how do you know what you already have and what you need? Also, you'll never be stuck at home with a meal you can easily put together. So, let me take a look at what I've got and make up my weekly menus for you here. I am leaving tomorrow afternoon for an overnight trip to New Orleans for the Living Proof Conference with a friend. I am so excited for this trip! It will be my first time leaving Ella overnight so I'm a bit anxious about that, but I know she'll be in good hands. I started Beth Moore's newest study Esther 7 weeks ago with some ladies from Luke 4:18. It has been a wonderful experience being in Bible study again. I'm still working on setting aside special time each day for my quiet time, but I am so thankful for all that God has shown me through this study. I look forward to what I will be hearing this weekend. I'll post an update later in the weekend when I return home. A new title...Whatever Wednesday is now Weight Loss Wednesday for the time being! Though I've already lost 25 lbs. in the past 2 months since having Ella, my goal weight is 20 lbs. lighter. I hope to be able to do this within the next 4 months, although I wouldn't be disappointed if it took me by the end of the year. I want to set a realistic goal! I turn 30 next February (how can that be?!?!?) and want to be in great shape & healthy. I know that the older you get, the harder it is to lose weight so I want to take care of this issue now. Keep track with me as I track my weight loss over the next few months. Posting this here will keep me accountable! Well, here I am behind in blogging...again! It's nearly 11pm and I'm filling in at work tomorrow, so this will be quick! We've been having a good week here. We went to the Exploreum this morning on a playdate. Taylor had such a good time. She's loves playing with her little buddy, Parker. I wish you could here her say his name...she says it with the funniest northern accent...it's so strange! They chase each other around all over the place! It never fails that Taylor falls asleep in the car on the way home from the Exploreum since it's a 20-25 minute drive. Luckily, she took a longer nap when we got home and I was able to rest a bit too with Ella. We are going to Chuck E. Cheese tomorrow night to celebrate Taylor's potty training. She's so excited--3 of her favorite things--Chuck E., pizza, and games! Mom and Dad are going with us. We are hosting a playdate at our house on Friday morning. I think it will be a lot of fun. It's a smaller group and the kids are really close in age and play so well together. I'll be reading from the book If You Give a Mouse a Cookie. The book I have includes a CD with a couple of songs to go along with the story. So, we'll listen to that and do a simple craft. I'll also have some sugar cookie dough and will let the kids cut out cookies with some new Easter cookie cutters I purchased this week from Target. I need to get a new photo card and will try to take some pictures of the girls to post soon! Ella is growing SO fast! I will be taking her for her 2 month check-up next week. Wow! I'm already behind in my blogging! Even though it's Tuesday, I want to backtrack and start with Menu Monday. Thursday: We're going to Chuck E. Cheese to celebrate Taylor being totally potty-trained (no accidents!) for one month. Way to go, Tay! Friday: I'll be going out of town for a Living Proof conference today and Taylor is spending the night with Nana, so Scott's on his own to get dinner wherever he wants! I think I will make some of these Banana-Chocolate Chip Muffins to take with me when I go to the conference. Saturday: Our sweet neighbor is bringing us enchiladas for dinner as a post-baby gift. Thanks, Laura! We'll be saving it for Sunday lunch since my sister is in town and we'll be eating dinner with my family. I'll be making banana pudding to share with my family. I have to tell you that I've made the Baked Ziti a few times already & it is FABULOUS! It makes a lot and I can usually get another casserole out of it to freeze for another meal. Keepin' it simple...or is it, really! Menu Monday--I'll share with you (recipes included) what we'll be having for the week. Toddler Tuesday--I'll be writing about my girls, of course. Whatever Wednesday--This will be a free day...to write about whatever I want to! Thoughtful Thursday--I'll reflect on what God's been teaching me this week. Favorite Friday--I'll share with you some of my favorites...websites, books, music, movies, etc. Savings Saturday--I love a good deal! I'll be blogging about deals for the upcoming week. Let's hope I can keep up with all of this! I'm thinking that's why I wasn't successful before because blogging was so random; I didn't know what to write about! a way to keep my life "organized"